Is The Time Of Your Death Predestined By God? Has the day of our death been predetermined? Are we powerless to change it? Has God specified a time for our death and the number of our days? I could have added dozens more but I think you get the idea. The way God thinks is nothing close to the way we think. When we can’t fully explain the ways of God we must accept it anyway. Just because I can’t explain how gravity works doesn’t mean it isn’t so and just because I can’t understand something doesn’t mean it’s not true but what about the day of our death? Is the day of our death predetermined? Is it down even to the hour and the second? Are all of our days established before we are even born? These are all great questions and the answers can be found in the Scriptures but the explanations; that I can’t help you with. That’s why He is God and we are not! Biblical wisdom has always been that we are like the grass in the field and so we should learn to number our days; that is we should make every day count. Maybe that’s what the Psalmist meant when he wrote “teach us to number our days, that we may present to You a heart of wisdom” (Psalm 90:12). He actually asked “Show me, LORD, my life’s end and the number of my days; let me know how fleeting my life is” (Psalm 39:4) so God “teach us to number our days that we may get a heart of wisdom.” When the religious leaders tried to take Jesus by force to have Him arrested He said “My time has not yet come, but your time is always here” (John 7:6) so God knows all about the days of our life and all of the affairs and schemes of men and we cannot change what God has sovereignly ordained ahead of time. Every one of our days, believe it or not, have already been determined and even more amazing, they have been numbered before we were even born. Job knew this when he said “Man who is born of a woman is few of days and full of trouble. He comes out like a flower and withers; he flees like a shadow and continues not. And do you open your eyes on such a one and bring me into judgment with you? Who can bring a clean thing out of an unclean? There is not one. Since his days are determined, and the number of his months is with you, and you have appointed his limits that he cannot pass” (Job 14:1-6). Imagine that! We cannot go one day beyond the day he has appointed for us to live. We have limits to our life. We cannot even “go one day beyond” them. The fact is that God’s “eyes saw my unformed substance; in your book were written, every one of them, the days that were formed for me, when as yet there was none of them” (Psalm 139:16). Not only are the very days of our life established “even the hairs of your head are all numbered” (Matt 10:30). “See, I set before you today life and prosperity, death and destruction. For I command you today to love the Lord your God, to walk in obedience to him, and to keep his commands, decrees and laws; then you will live and increase, and the Lord your God will bless you in the land you are entering to possess. But if your heart turns away and you are not obedient, and if you are drawn away to bow down to other gods and worship them, I declare to you this day that you will certainly be destroyed. You will not live long in the land you are crossing the Jordan to enter and possess. This day I call the heavens and the earth as witnesses against you that I have set before you life and death, blessings and curses. Now choose life, so that you and your children may live” (Duet 30:15-19). You have a choice to make. Repent and trust in Christ or face God’s wrath with no end in sight (Rev 20:11-15). He tells us “Today, if you hear his voice, do not harden your hearts” (Heb 3:7) and “In the time of my favor I heard you, and in the day of salvation I helped you. I tell you, now is the time of God’s favor, now is the day of salvation” (2 Cor 6:2). Tomorrow may be too late for if Christ returns and you are not saved, you are condemned for all time but if you repent and trust in the Savior, you will be saved. Let me close with the way Daniel the Prophet puts it: “at that time your people—everyone whose name is found written in the book—will be delivered. Multitudes who sleep in the dust of the earth will awake: some to everlasting life, others to shame and everlasting contempt. Those who are wise will shine like the brightness of the heavens, and those who lead many to righteousness, like the stars for ever and ever” (Dan 12:1a-3). You are free to choose but choose you must, for no choice is a no-choice because Christ said “He who is not with me is against me and he that is not against us is for us” (Matt 12:30). That`s a very good article because I have found out a few things at Question`s.org but I thought of them before I evan went there!!! Coincidence is God and it`s only mentioned in the bible once by Jesus about the Good Samaritan He says Chance. Like you said Jack in your article we are no where near, nor will we get any idea what God thinks and does. People say quite a few times or it`s only Coincidence,but they don`t realize that it`s God doing it for a purpose. I am a Jealous God and I thought that`s a sin God can`t sin,but when I looked it up it said God created everything. We think it was our idea to make any thing up but it was God so every thing is God`s creation that`s why He is Jealous God,and we are trying to take credit for it. Has you pointed out in your article you could have mentioned a lot more Jack. I can only describe His power beyond belief? About the email jack it was different it had Josh and it brought me straight here so God had created Coincidence. So the other emails are different. Thanks Anthony…I think we will ever be learning even into eternity since God’s mind is infinite and we are finite. I do believe we’ll know so much more than because guess what, we’ll have better than a Q & A there with us….God in Person! Whooo hooo… can’t wait. Thank you for the above article. i was however hoping to find something more from it and would appreciate your view on my question. I accept that everything is predestined. Does it then mean that if someone commits suicide that God allowd it because it was that person’s day, or was suicide an act of disobedience? If suicide is disobedience, could we still apply the pribciple of Rom. 8:38-39 “For I am convinced that neither death nor life, neither angels nor demons, neither the present nor the future, nor any powers, neither height nor depth, nor anything else in all creation, will be able to separate us from the love of God that is in Christ Jesus our Lord” and find peace in that, regardless of the act of disobedience that, because the person who commited suicide was a believer, will be saved? Your reply would be much appreciated as our family recently lossed a love one, who suffered from depression for many years, in that manner. Hello Hetta…please forgive my late response to this. I am so sorry for that. As for your question, yes, there have been circumstances where people have the lifelong fruit which is evident of their salvation and that they later committed suicide and yes, the way the Bible speaks about salvation, I believe they are secure in their faith and will be with the Lord. I remember the nightmare of seeing many people just jump to their death during the twin towers because of the agony of the fire, they jumped to their death rather than burn to death. Did these people take their own life? And were many of these Christians? Yes to both so that shows me, as you said, the Roman 8:38-39 are true, regardless since even death cannot separate us…also read John 6:37, 39, John 10:28-29. Again, my deep condolences for your great loss but I do believe you will see them again someday. Thank you for this article, Jack! Your words stirred my heart and I lift you up my brother, to our God Almighty, that He may bless you according to His great riches in His perfect timing. Excellent points to an age(s) old question. God is so great (omnipotent, omnipresent & omniscient) that He knows both the number of our days while TAKING INTO ACCOUNT our free will choices! All the hairs on our heads are numbered and nothing escapes His sight! The Lord knows those who are His as well as the motives of every man’s heart! Jesus knows everything there is to know and no one needs to tell Him anything! The Father and Jesus are one. Upon Jesus’ resurrection, He sent us the Goly Spirit to dwell within us. The Spirit reminds us of Jesus’ words, leads us into all truth and reveals the future as God sees fit. Awesome! God is so much BIGGER than we think He is. He is infinity and yet loves each of us unconditionally! He died for us, by becoming sin for us, in order to take the penalty we deserved. He took on our infirmaries and healed our diseases! Jesus was perfectly obedient to God and was tortuted and crucified WHILE WE WERE YET SINNERS! (What GRACE, MERCY & LOVE!) Then God showed His acceptance of His son’s obedient sacrifice by raising Him from death to life! Hallelujah! Hosanna! What an AWESOME God we serve in love! His loving-kindness extends from generation to generation and His name is the hope of all the world! Let’s praise His name for evermore! Jack, I’ve been blessed, as is everyone who reads your articles are, and appreciate your commitment to Christ. May you and yours be blessed by Him who loves us. May your Thankgiving be joyful and your Christmas be filled with love. Thank you Mrs. Larson for your very kinds words. You are more generous to me than I truly deserve and I see that you must be an encouragement everywhere you go and so may God richly bless you my sister in Christ. hi jack its me again,i have a question ,can one die before their time and if so then what happens to those numbered days God prepared for you? If the day of our death is determined as many Scriptures clearly indicate then we cannot die even one second earlier knowing that God is sovereign over even the sparrow that falls to the ground. Thanks Rocky…so good to hear from you again my friend. I appreciate your encouragement Richard. Thank you so much sir. Hello jack, these are really mind opening and clarification of some confusing thoughts , my question is similar to rockys , so if our days are numbered, does it mean that even accidents or stray bullet hitting someone and killing the person is the way they are willed to die? And does God know when and how everyone will die? When the bible says God will make a man have long life if he does not sin, does it mean God can change someone’s destiny if the person sin? Thank you sir. 1. Is there a possibility that people die early even though the permissible will of God allows them to live longer ? 2. My wife died of a terminal illness. When we checked with a doctor, it was already late. After getting treatment and fighting for one year she passed away. Had we found out earlier, do you think she will still be living or the date she died was appointed for her, irrespective of what we do ? 3. Those who commit suicide die prematurely ? Hello Arulnathan and thank you for your comment and questions. People die not one second earlier than they are appointed to as far as the Bible reads (e.g. Heb 9:27) and as the psalmist and Job said, they cannot exceed that limit. That is all I can tell you from the Bible. The other questions are speculative and where the Bible is silent, I must be also. Does that make sense sir? Rod, as a believer in the one true and living God, isn’t the day of our mortal death the day of our going home to Him? When we are absent in body we are present in spirit. If you believe this, then the day your Mom departed here was the day God welcomed her home to her reward. The prayers that were offered for her would have been so that God’s will would be done and she would have been happy and be even more so when she knew that her physical death led to the rewards of a life with God since she was a faithful christian…for that is the hope of each and every one of us who choose Him, isn’t it? Would she be unhappy now? Or is it your own grief and your will that you are struggling with. Quite normal for those of us left behind until we can look forward to joining them at the time appointed for us. Much sympathy. We all have to make the emotional journey in our own time and way. God has not abandoned you, or your mom. I only responded because He wanted me to. Wish you comfort and hope. Thank you for your article. God used it to provide me the answer to a question that I have been praying about and to grant me peace and hope anew about the issue, and to speak to one of your commenters. May he continue to bless, guide and strengthen you and all of us who are seeking to walk in joyful submission to him. Samiya, thanks for replying and your wish for my comfort and hope. One thing though, just wanted you to know that my prayers were for her healing and not for Gods will to be done. Maybe that makes me a bad Christian but all I kept praying especially when she had to go on the ventilator was please father don’t take your daughter home yet….please please please heal her and let her stay with us. You’re right she’s in paradise now and very happy but her or myself in no way wanted that at this time in our life’s I promise you that. Thanks again for replying and I’ll try to become a better Christian. God Bless you! This is so true, I had a very frustrating conversation with my room mate, and then my mother yesterday about this. I had asked a simple question to them regarding this topic and they brought in so many “circumstances” into the equation which I would say brought doubt into the belief of whether or not it’s “our time” or “not our time” I found myself explaining to them on a very elementary level about the circumstances being not of God, He is the author and decider on “circumstance” for there is no circumstance when God is in control of your life and you are submitting to His will for you. We all fall short of course. Anyway, one of the “circumstances” was the typical: “Well, if you get in the car with me and it is my time to go and I was suppose to die that day then how is that?” So, of course I brought in the very elementary cleche of “Miracle” and what I mean by Cleche is that people use that word as if it is something that is given to us in this world by an unknown source, or that we have so many of them, or we can buy them. A miracle is just that, it’s miraculous a performance by a supernatural source or power and that would be God in the Holy Spirit. Again, God plays the role her, he “spares” my life miraculously and you my dear friend are meeting the time that God had for you. My room mate then proceeded to say “walking through gun fire” and mind you this is a Christian man at age of 50 giving these over and over again. I then said again, very simple, God is in control, we hear these stories all the time. We can not know God and His ways entirely, we, as knowledgeable children of God at least know that much, we do not have the omniscience of God so how can one even think that they could imagine or conjure up a scenario that would supersede God’s ability. Too funny right. The bottom line is that God chooses, do we know the day or the hour? No! 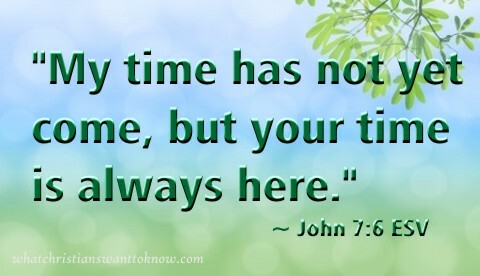 because with that, God is not on our schedule, He is not on our time, He meets us in His time and His time alone, and man made the clock, man made the hour, so His time may not be an actual date and time, we think it is, but the “season” or “His time” may simply be when we are done on this earth. I do not even say that as far as free will or Gods will has or does not have anything to do with being able to change this, God is forever the same, and do we even know if God has a “set date” to this, or will our own actions “change” this date, maybe, but it is not us that is changing it, it is God… maybe we do get in the way of our “growth” or time, but living outside of God’s will is Hell anyway, so we are only prolonging His will for us, here or in eternity by living in the world and not in the spirit, so “time” may not be time at all but a place in which our understanding and knowledge and fullness of God within us on this earth is reached. I hope that this made sense, lol, I am rushed haha.. I wrote to you earlier and you replied back on the time of ones death etc. It is nearly 3 years since my wife went to be with the Lord. But still I am grieving and struggling. Any idea what the scripture teaches about our lives in the millennium ? Will we be with the now departed loved ones as a family ? I learn that the emotional attachment may not be there. But any idea how we will be there ? I read that if we will be obedient we shall live longer but how about those babies or children die in war or sickness just confusing..
Hello Haidee. Ex 20:12 says “Honor your father and your mother, that your days may be long in the land that the Lord your God is giving you.” That doesn’t guarantee a long life, but it does say it will go well with you and those who honor their parents generally live longer than those who do not. Not sure how that works, but it does. Thank you for your comment. As for babies who die young, they are not able to keep this command, but the Bible seems to indicate that babies and young children go to heaven or at least will not be judged by God since they were not old enough to know how to repent and believe.